Direction (1-5): Read the following information carefully and answer the questions given below. In alphabet series A-Z, each letter except vowels is coded as 2 to 9 from A till Z (For ex. B is coded as 2 and C is coded as 3 and so on till K is coded as 9. Again L is coded as 2 and so on till Z). The vowels are coded by using the symbols #, @, %, $ and &. In a certain code language, ‘Something are happen’ is coded as ‘8$3%97#46 @77 7@55%4’, ‘Taken for inquiry’ is coded as ‘9@9%4 5$7 546&#7#’ and ‘Measure by weight’ is coded as ‘*%@8&7* 25 3%#679’. i) If the first letter is a vowel and the last letter is a consonant, then both are to be interchanged. ii) If the first letter is a consonant and the last letter is a vowel, then both are to be coded as ‘*’. iii) If both the first and last letters are vowels, then the last letter is coded as the code for second letter. 1. What will be the code of ‘Home Ministry’? 2. What will be the code of ‘Escalate Module’? 3. What will be the code of ‘Indices Can Wide’? 4. Which of the following will represent by the code ‘5%@7 759%@’? 5. What will be the code of ‘Distributed’? Direction (6-10): Each of the following questions below consists of a question and three statements numbered I, II and III given below it. You have to decide whether the data provided in the statements are sufficient to answer the question. Read both the statements and give your answer. 6. Eight persons P, Q, R, S, T, U, V and W are sitting in a circular table and facing centre of the table. Who among the following sits fourth to the right of S? R sits third to the right of S. U sits second to the left of Q, who is an immediate neighbour of R.
T and P are immediate neighbours. Only one person sits between V and P.
III. V sits third to the left of T, who is not an immediate neighbour of U. By using statements I, we get the answer. 7. Eight persons are sitting in a straight row and all of them are facing north. Who among the following sits exactly between E and G? E sits at third from either ends of the row. Two persons are sitting between F and B. D sits third to the right of H and is an immediate neighbour of E.
III. H sits second to the right of G.
8. How is T related to N? N is the daughter of V, who is the husband of S. G is the daughter of B.
K is the only son-in-law of T. S is the sister-in-law of G, who is the sister of V. B is the wife of T.
III. 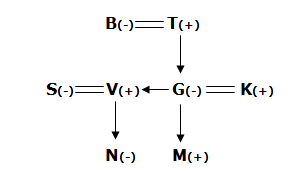 M is the nephew of V, who is the only son of T. T is the father of G.
9. Seven persons are living on seven different floors of the building in such a way that the ground floor is numbered one, the one above is numbered two and so on till the topmost floor is numbered seven. Who lives on the topmost floor? Only two persons are live between P and V. More than two persons are living between Q and R, who lives on one of the odd numbered floors. Only three persons are living between Q and R, who lives on odd numbered floor. T lives on the ground floor. P lives one of the floors above Q.
III. Only one person lives between V and W. S lives immediately below R, who does not live on the even number floor. 10. Six persons A, B, C, D, E and F are in different weights. Who among them is the second lightest in the group? A is heavier than E. C is lighter than both B and D. F is lighter than E.
B is heavier than F but not the heaviest. C is lighter than A.
III. Only two persons are between D and E. B is heavier than E but not lighter than F.
By using statements I, II and III, we get the answer. 1) What will be the code of ‘Home Ministry’? 2) What will be the code of ‘Escalate Module’? 3) What will be the code of ‘Indices Can Wide’? 4) Which of the following will represent by the code ‘5%@7 759%@’? 5) What will be the code of ‘Distributed’? 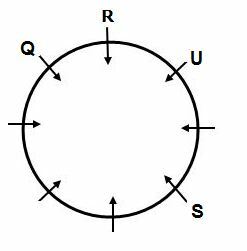 6) Eight persons P, Q, R, S, T, U, V and W are sitting in a circular table and facing centre of the table. Who among the following sits fourth to the right of S? 7) Eight persons are sitting in a straight row and all of them are facing north. Who among the following sits exactly between E and G? 8) How is T related to N? 9) Seven persons are living on seven different floors of the building in such a way that the ground floor is numbered one, the one above is numbered two and so on till the topmost floor is numbered seven. Who lives on the topmost floor? 10) Six persons A, B, C, D, E and F are in different weights. Who among them is the second lightest in the group? By using statements I we get the answer.